One of the most common complaints or struggles from amateur golfers is that they just can’t make consistent contact. Sometimes the contact is fat, or heavy, and other times it’s thin, topped or bladed. The other thing that a lot of amateur golfers struggle with is the direction of a shot. Both of these issues have to do with the impact position. In my opinion, impact is the single most important position in the golf swing. There are a lot of unique golf swings on the professional tours that all work. Some instructors like to teach one universal “correct” swing, but that’s not always the case. There is room for tweaking some fundamentals here and there. As long as a swing can consistently return to the impact position with the correct angle of attack and face angle, then the shot will work. The impact position is one of those things in golf that is almost universal. Everyone wants to get to the same impact position. When it comes to the proper impact position, there are two main elements to keep in mind. The first, is the angle of attack. The angle of attack is the direction the club head as it moves toward the ball. This angle is measured in relation to the ground. The two main options are downward and upward. Both are used to create different shots, which I’ll discuss more in the sections below. Next, the other important element is the clubface angle. This refers to the direction of the club face in relation to the target line. The three options of the clubface angle are open, closed, and square. Again, none of these angles are necessarily wrong, but they will create different shot directions. In general, a square face will result in a straight shot, an open face will cause the ball to go right for a right-handed player, and a closed face will cause the ball to go left for a right-handed player. I’ll reference a square clubface most of the time in the sections below because most players want a ball to fly straight. The correct combination of these elements just depends on the type of shot you want to hit. The first shot I’ll talk about is an iron shot; this will apply to most chips and pitch shots as well. This is one of the most misunderstood impact positions in the game of golf and, unfortunately, it’s also one of the most common shots. The majority of golfers believe that in order to get a ball in the air, they need to get under the ball and lift it up in the air with an upward swing at impact. This is a misunderstanding of how an iron shot works. Instead, the angle of approach on an iron shot is downward; and at a fairly steep angle. You want the clubface to be traveling down, into the ground, through the ball. This angle will create backspin on the golf ball. Then, that backspin, paired with the dimples on a golf ball, will create lift, similar to wings on an airplane do. The goal of an iron shot is to make impact with the ball and then the ground, in that order. Too often, golfers make impact with the ground first, which slows down the club head, allows debris in between the club face and the ball, and results in less spin, less height, and less distance. Next, when it comes to the clubface, if you desire to hit a straight shot with your irons, you’ll want to have a square clubface at impact. Now, the clubface angle can be more difficult to adjust and notice because your club is traveling fast through impact. A good way to give yourself the best chance of getting a square clubface is to start your swing in a comfortable position where the clubface is square. Again, a lot of amateurs don’t even realize this, but many of them start with iron club faces slightly open. An open clubface adds loft to the club, so it appears easier to hit to the player’s eye. Unfortunately, it makes it harder to get the clubface square at impact. So, make sure that the grooves on your clubface are perpendicular to your target line or feet line. This will ensure that your swing starts with the clubface square to the target. Remember, with irons the bottom of the swing should be in front of the ball. The next shot is one of the most difficult full shots in golf because there is the least room for error. But, hitting a fairway wood can also be one of your biggest advantages if you master it. In the previous section, I mentioned that the angle of attack for an iron shot is downward and pretty steep. That means that the clubface is traveling downward fairly quickly. With the fairway woods, the angle of attack is still down, but it is much shallower. This shallow, downward angle of attack will result in a divot, but not nearly as big as an iron shot. You’re almost trying to bring the club through the impact zone level to the ground. The key here is not to swing up at the ball because it’s not possible; the ground will not allow it to happen. Swinging up at the ball often results in a fat shot or one where the club head feels like it almost bounces over the ball. Again, like I’ve mentioned before, in most cases you’ll want a square clubface at impact. Make sure your club head rests freely on the ground and you’re not forcing it to sit in an incorrect square position at address. Fairway woods are designed to sit freely on the ground in a square position. Use this to your advantage, so that you come through impact with a square clubface. The ideal impact position for a drive can be hotly debated when it comes to the angle of attack. Some people say that you should swing with a slightly downward angle of attack. I would disagree with that though. I believe the correct angle of attack with a driver is slightly upward. Since you get to use a tee with your driver, use that elevated position to your advantage. Hitting up at the ball at impact will give you a higher ball flight which will result in more distance. Also, typically, a downward attack angle, on any club, will create more spin. The same is true with the driver. If you were to swing down on the ball, you’ll create more spin, which is not what you want for this type of shot. So, when it comes to the proper impact position with the driver, the club head ought to be traveling slightly up. When it comes to the clubface angle, a square face will once again create a straight shot. That being said, a lot of amateurs don’t address the ball with a square face, which will help them return to impact with a square face. Many golfers feel the need to position the top of the face perpendicular to the target line. Unfortunately, that is not the correct position. Instead, most drivers are designed to rest freely on the ground in the square position. 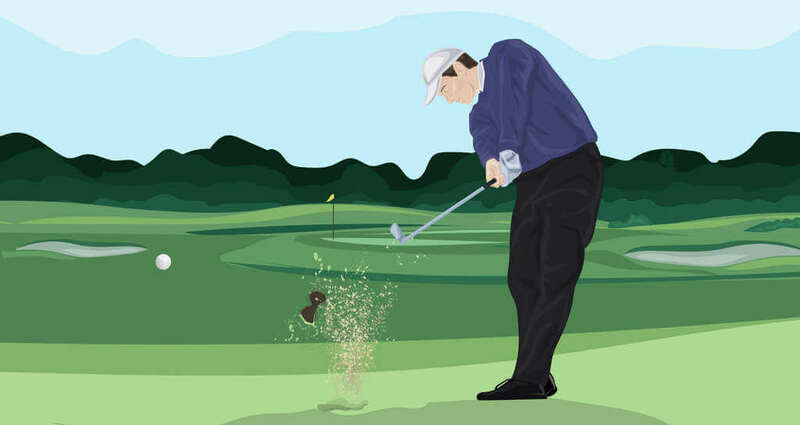 So, to address the ball with a square face, simply let the club head rest on the ground. The final shot I’ll talk about here is the greenside bunker and flop shot. This is a shot that isn’t used as frequently because it’s very specific, but it can be a fun one to hit because it’s a little different than the ones listed above. 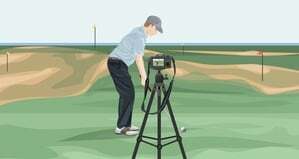 First of all, the angle of attack is down, but the goal is to hit the ground first and have the club slide under the ball at impact; it can be difficult to hit on a tight lie for this reason. So, at impact, the club is coming in very shallow, so that it can slide under the ball for the longest amount of time. When in a greenside bunker, that entry point is about 1-2 inches behind the ball. When hitting these shots, you want to get the ball up in the air quickly, so you need to add loft to a club. In order to add loft to a club, you’ll come through impact with an open club face. To make sure you have an open club face at impact, address the ball with the face laying open. I said earlier in the “irons” section that hitting down on the ball gives the shot height, that’s not the case with these shots. Instead, you want to use the loft of the club and loft you’ve added by opening the face to get the ball elevated. I’ve mentioned some common mistakes that a lot of amateur golfers make in the sections above, but in this section, we’ll highlight the main ones, so that you can keep an eye out for them in your swing and not do the same. 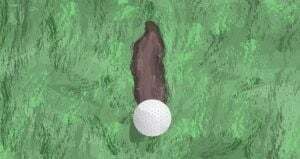 First, like I’ve said, one error is that too many golfers try to get under the ball with their irons. This only creates shots that are shorter with less spin. Make sure you’re hitting down and through the ball to get more spin and distance. Think about covering the golf ball with the right shoulder. Another issue that golfers struggle with is that they keep the clubface square or closed in a greenside bunker shot. In a lot of people’s minds, it should be closed to dig the ball out. This closed clubface at address will only result in a closed clubface at impact. Instead, use the sand to your advantage and open the face, so you can slide it under the ball and pop it up and out of the sand. Again, a common mistake with the driver is to address the ball with the clubface closed, which results in a closed clubface at impact. 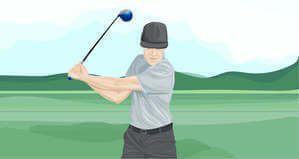 Let the club rest freely at address, so that the impact position will come through with a square face. Finally, since a lot of people struggle with hitting fairway woods, they try to swing up at the ball with them. Unfortunately, this is incredibly difficult to do and only makes it more difficult to hit the fairway woods well. Make sure you hit the ball first and then the ground on a shallow downward angle to get the best results with the fairway woods. In this section, I’ll discuss a couple great drills to help you improve your impact position, so you can start making more consistent contact. This first drill is one of my favorite drills to practice in golf. It’s super simple and does the trick really well. Basically, just put a tee in the ground about ½” directly in front of the ball. 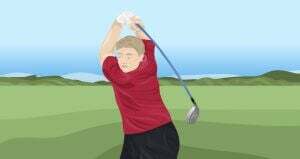 Push the tee all the way down, so that it’s flush to the ground. Then, put a second tee in the ground just outside the ball. Hit your shots and try to take out the front tee with your divot. 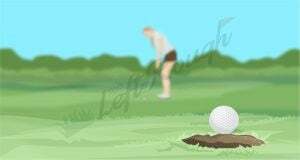 After you’ve hit your shot, you should notice that your divot starts after the outside tee and it continues through the front tee (the front tee should disappear after being hit). This will help you to create a downward angle through impact. Next, get an impact bag to take some swings in to. Take some swings with your irons and woods. Practice making the loudest noise at impact. This loud noise comes from a square face at impact. You’ll probably notice that when you come through impact with an open or closed face, it’ll be a lot quieter and not sound nearly as solid. Once you can consistently swing and get to impact with a square, loud, position, you’ll be able to hit all of your clubs a lot straighter. Throw some balls in a practice bunker. Then, draw a circle with your finger around the outside of the golf ball. The diameter of the circle should be about 3 inches. 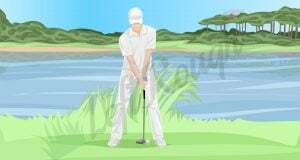 Practice your shots trying to envision hitting all of the sand inside that circle on to the green. You’ll notice that the impact position is a little bit heavier, but also slides under the ball to get it in the air. An alternative to the circle drill is to just draw a long line in the sand. 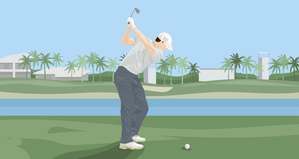 Take practice swing after practice swing, without a ball, where your goal is to create a divot right on the line you’ve drawn. This will give you a lot more control over the impact position. If you can consistently enter the ground where you are intending, then you’ll have a lot more luck with these shots. That’s just about everything you need to know to create the perfect impact position. The two most important parts are the angle of attack and club face angle. If you’re able to get those correct every single time, then you’ll see the ball travel straighter, higher, and longer in no time. It goes without saying, but impact is the most important part of the swing sequence so you cannot spend too much time analyzing it.